Wabash Trace Nature Trail Marathon (SCIA) 619 W. Sheridan Ave.
in United States	at Wabash Trace Nature Trail Marathon (SCIA) 619 W. Sheridan Ave.
Marathon starts at East Mills High School, Malvern, IA and runs on Wabash Trace Nature Trail to downtown Shenandoah, IA. Marathon Relay starts at East Mills High School, Malvern, IA and runs on Wabash Trace Trail to downtown Shenandoah, IA. For complete event information, please visit www.shenandoahiowa.net and click the marathon link on the home page or email using the "Contact the Organizers" button on the left hand side of your screen. A Boston Marathon qualifying race, Wabash Trace Nature Trail is a tree-lined mostly flat converted railroad line that crosses through the scenic Iowa countryside. All three events are point-to-point races and finish in downtown Shenandoah. This year we salute 1st Responders and U.S. Military! 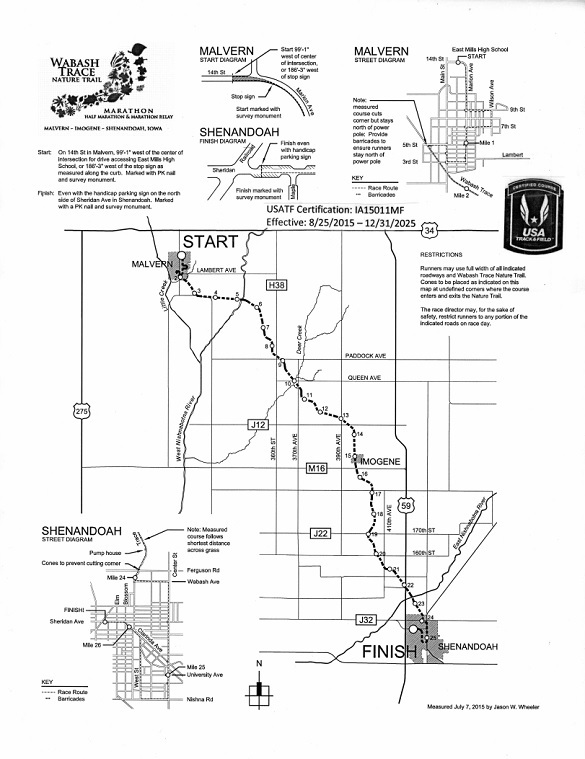 Full marathon & marathon relay (5 member teams: male, female, mixed gender, or military/1st responder) 8 a.m. start in Malvern; half marathon 9 a.m. start in Imogene. 6 hour time limit. Pre-race pasta dinner night before the races at the Depot, 101 Railroad Avenue. Race packet pickup at 100 S. Maple St. Shenandoah on Friday Sept. 9, 5-8 p.m. or at start of each race. Tech shirts & medals to all finishers, age group and overall prizes. Awards to overall 1st-3rd in each gender & 1st & 2nd age division in 5 year increments from under 18 to 70 & over. Awards to 1st & 2nd Relay Teams. Profits go to Wabash Trace Trail and community sponsors Shenandoah Chamber & Industry Assn., Southwest Iowa Nature Trails, Sons & Daughters of Imogene, Malvern Area Betterment Assn. Music, food, beverages, awards after the races at the Depot. No awards, medals or t-shirts will be mailed. For Hotel accommodations in Shenandoah Call Shenandoah Inn & Suites, 712-246-3000, Tall Corn Inn 712-246-1550, Express Inn & Suites 712-246-5733. Tent Camping available in Sportsman's or Trail & Tent at Rapp Park in Shenandoah contact Parks & Rec. at 712-246-3409. Malvern accommodations: Pierce Crossing is a guest house, Phone 712-624-8850. For RV camping at the Fairgrounds RV Park call Bob @ 712-520-6663 or Woody @ 402-740-4028. [*}There are NO Transfers or Refunds. This event is now U.S.A. Track & Field Certified. When this page loaded, the official time was 9:04:55 AM EDT.